Peanut Butter Bran Cereal Cookies are crunchy peanut butter cookies made with All-Bran cereal. Their texture is crisp and slightly crunchy but not hard. They're fairly light textured. Preheat oven to 375 degrees F. Line 2 large baking sheets with parchment paper or foil. In a mixing bowl, beat butter and peanut butter until creamy. Add sugar and beat well, then add egg and beat until light and fluffy, scraping sides of bowl often. Beat in the vanilla. Scrape sides of bowl and sprinkle baking powder, baking soda and salt directly into batter. Beat well, making sure leavening agents are well distributed. Add the flour and stir until it is mixed in, then stir in the crushed cereal and the peanuts. Using a tablespoon, scoop up dough and shape into balls (you should get about 36 total). 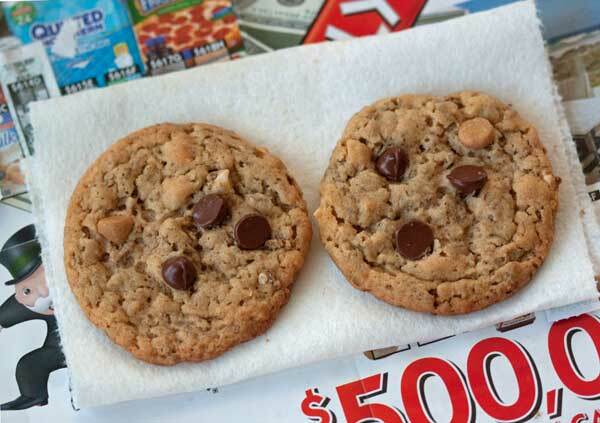 Arrange on baking sheets (or put the dough balls in a bag and keep chilled until you're ready to bake), press down with tines of a fork (or skip this step if you prefer) and press a few chocolate or peanut butter chips into the dough (if using). Bake for 8 to 10 minutes or until cookies appear set and edges are lightly browned. Let the cookies cool on the baking sheet for about 5 minutes, then transfer to a rack and let them cool completely. Their texture improves once cooled, so don't be tempted to eat them while warm.